Taddy & Co. produced three sets of 15 cards per set, in their Prominent Footballer series: 1907, 1908 and finally in 1913. The first series has already been featured and this particular card of A. Nicholls is the fifth from the second series that was issued during 1908. A number of cards included the same players as the first series, but with alternative backs, namely: W. Barnes, S. Downing, J. Fidler, A. Gittins, E. Lintott, J. MacDonald, J. McLean, A. Mitchell, A. Rogers and C. Shaw. I have found few details regarding A. Nicholls. 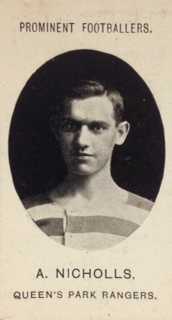 However, there was a goalkeeper named ‘Arthur Nicholls’ who appears to have started his career at Port Glasgow. He may well have joined the Rangers in 1907, but he didn’t make his 1st team debut until some years later on 20th January 1912 against Watford. This could well be the case, as the famous Rangers No.1, Charlie Shaw, didn’t miss a 1st team game for over 4 seasons from 1907/08. Arthur’s last match for the Rangers was against Watford on 25th April 1914. Having spent several years trawling through the old newspapers for the site I am amazed Shaw managed to be ever present for the years he was. Games were at times more like brawls in the early days and goalkeeper bashing was fair game! It must have been a significant event for a newspaper to have noted the fact.